Rattle Records 001- Granada Techno City. GONCALO M is the producer of the first track called like the EP: Granada Techno City. It's a powerful hardgroove track inspired by the connection of GONCALO M with the city of Granada. 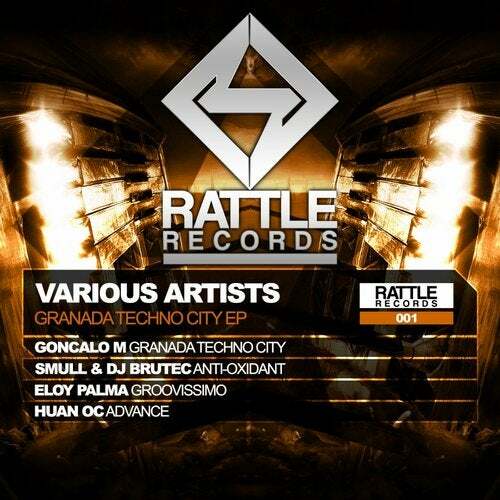 The second track is ANTI-OXIDANT, produced by SMULL & DJBRUTEC from Spain. It's also a powerful hardgroove track. GROVISSIMO, by ELOY PALMA (Spain), is the third hardgroove track of this EP with a lot of rythm and percussion. The last track,ADVANCE, by HUAN OC (spain), it's a hardtechno track with atmosphere sounds and a lot of energy.